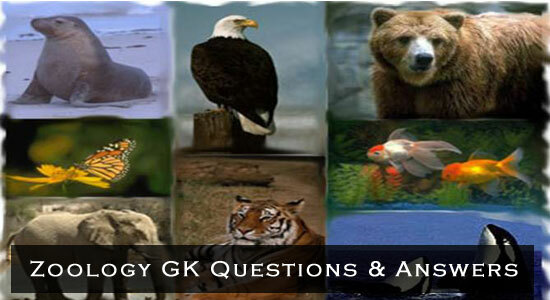 This is the Part 1 general knowledge questions and answers section on “Zoology” with explanation for various interview, competitive examination and entrance test. Solved examples with detailed answer description, explanation are given and it would be easy to understand. The word animal comes from Latin, meaning “breath” or “soul”. It includes mammals, birds, reptiles, fish, frogs, clams, lobsters, insects, worms, jelly fish etc..
2. What is Binomial nomenclature? The scientistific system of giving a double name to each plant and animal consisting of the name of the genus followed by that of the species. 3. What are Arboreal animals? Organism that live on trees and branches are called Arboreal amimals. 4. Which is the biggest cell? 5. which animal is the biggest? Blue whale which has been known to have a length of 30 metres and have an average weight of 6500 kg. The tallest liveng animal is Girraffe with an average height of 20ft. 7. Which is the biggest land animal? The biggest living land amimal in the world is the Affican bush elephant. Mammal is a warm-blooded vertebrate animal which suckles its young ones. Monotrremes are mammals that lay eggs. Marsupials keep the young ones in pouches and placentals give birth to the young ones. 9. How many species are there in mammals?